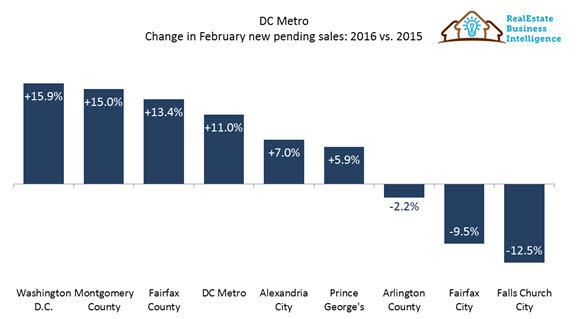 The DC metro real estate market “righted” itself in February after experiencing weather-related declines during the previous month. With the snow melting away, the region saw more activity in contracts, listings, and sales, according to data analyzed by RealEstate Business Intelligence (RBI). Buyers and sellers could breathe a sigh of relief as the apparent dip in January new listings was an anomaly and the market has resumed its steady and consistent growth pattern again. Even though median sales prices have dipped for three months in a row, prices could be leveling off (and January is tricky to read). 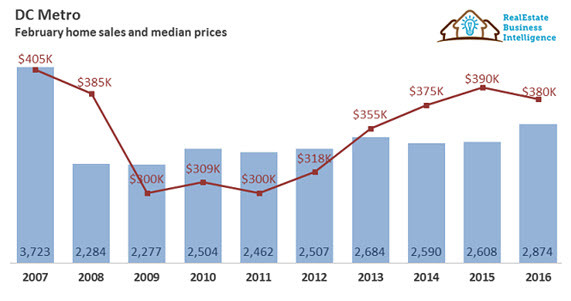 With a median price of $380,000, it is the first decrease since 2011, which was a low of $300,000, and only 6.2% off the $405,000 peak in 2007. Sales volume was up 10.5% from last February, hitting $1.36 million across the region. Prices were slightly lower from last year, a 2.6% dip, but still above the 5-year and 10-year averages. It was the 15th month in a row of increases in year-over-year closed sales. All property types experienced a bump in the number of contracts from last year – condos up 13.8%, single-family detached homes up 10.9%, and townhomes up 8.0%. Average sale price to original listing price ratio was 96.7% — same as last February. Median days-on-market was 44 days, just a slight 2-day increase from last year. Prices – All property types saw a dip in median sales prices, with the median sales price — $380,000 — coming in at 2.6% lower than last year. Prices remained 4.5% above the 5-year average and 8% above the 10-year average. Many jurisdictions saw price increases from last February, including the District ($500K to $538K); Alexandria City ($509K to $535K); Montgomery County ($360K to $370K); and Prince George’s County ($215K to $223K). Arlington County and Fairfax County declined slightly. Closed Sales – The region saw a 10.2% increase in the number of closed sales with 2,874, compared to last February. February 2016 marked the largest number of closed sales since the peak of 2007, which had 3,723. Recent data show that the region continues to show steady growth in sales since 2014. All property types saw increases in sales last month. 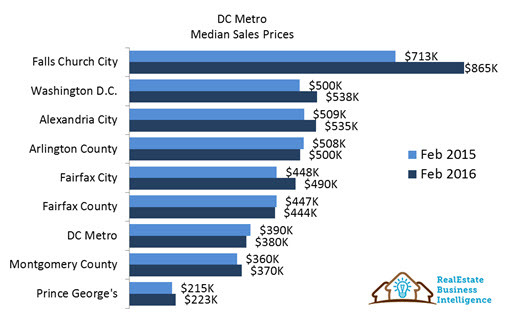 Across the DC metro market, most jurisdictions saw increases except for Arlington County (-11.3%), Alexandria City(-12.7%) and Falls Church City (-75% based on going from 12 to 3 sales). Fairfax County had the largest number of sales with 834, a 9.2% increase from last year. The District saw a 4.0% increase, Fairfax City 40.0%, and Montgomery County and Prince George’s County both with a 19.9% increase. New Pending Sales/Contracts – The District had the largest jump in pending contracts, up 15.9% from last year. This February just topped the 2012 peak of 4,501 new contracts, coming in at 4,533. This was up 11% from last year and up 32.4% from snowy January. All property types enjoyed the increase with condos +13.8%, single-family detached +10.9% and townhomes +8.0%. New Listings – There were 5,171 new listings, up 5.1% from last year and 8.5% above the 5-year average. Most of the region saw an increase in new listings compared to last February, with Prince George’s County seeing the most at 20.1%. The District had a 10.8% increase and Fairfax County 4.3%. Montgomery County (-0.8%), Alexandria City (-7.0%) and Arlington County (-10.2%) all had a decline in new listings from 2015. Both condos (+10.1%) and single-family detached homes (+5.7%) had a bump in listings, but townhome listings dropped by 1.5%, compared to last year. Inventory/Active Listings — Inventory was slightly above the 5-year February average of 7,879 with a total of 8,293 this month. February marked a 1.4% increase in month end inventories from last year and just about equal to the previous month. Both condos (+4%) and single family detached homes (+2.1%) were up, but townhomes (-4.3%) were down compared to 2015. Jurisdictions within the DC metro region were split in terms of year-over-year increases in inventories – The District came out ahead with +12.4% increase, along with PG County at +7.1%, and Fairfax County at +5.4%. Showing a decline from last year were Arlington County (-2.2%), Montgomery County (-7.5%) and Alexandria City (-12.9%). Average Sales Price to Original List Price Ratio — The region’s February 2016 average of 96.7% was the same as in February 2015. 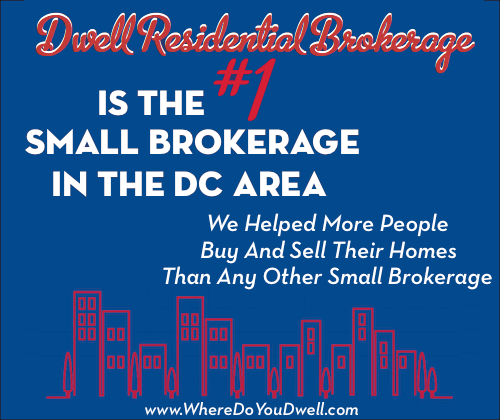 Homes in the District sold at 99% of their original list price and up slight from the previous year. Except for Falls Church City (with only 3 sales), all other jurisdictions experienced a ratio of 95.1% and above, hovering close to the previous year’s ratio. Days-on-Market – The median DOM was 44 days, up by two days from last year. Homes in the District had the lowest median DOM at 20 days, same as last year. Fairfax County was at the other end of the spectrum with a median DOM at 62. Single-family detached homes were taking 50 days to sell, while townhomes were at 35 days. Condos came in at the middle with a median DOM of 47.